No matter how advanced of a skier you are, you can always improve. Even if you're confident on difficult trails, you should actively keep working on your form, technique, and balance, because doing so will help your skiing. Also, there's another dimension of skiing that couldn't be more important for expert skiers: safety. Read on for tips to improve your skiing, even if you're at the top of your game. It's important for advanced skiers to take a step back for a moment and reevaluate their skiing form. Getting back to the basics by paying attention to the position of your hips, ankles, shoulders, and hands will help you to become more powerful and agile on your skis. 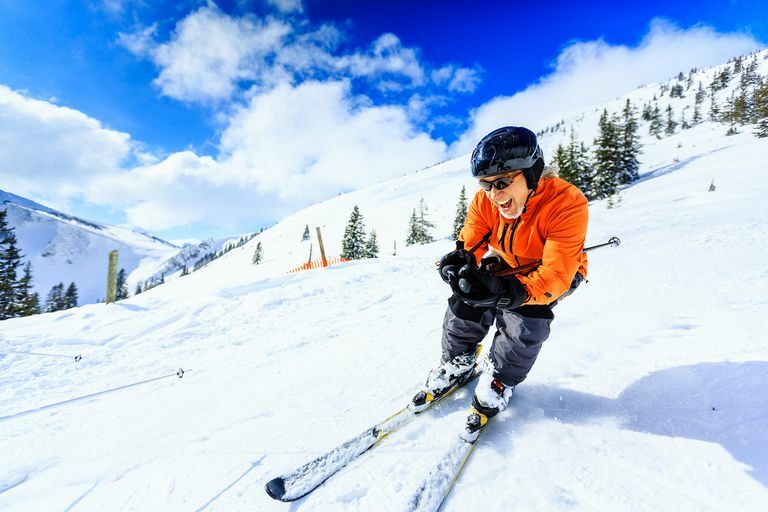 Ski instructor and author of the ski instruction book "The 7 Secrets of Skiing" Chalky White says that doing the ankle flex test helps the skier ensure he is using the correct postures and maintaining balance, even on rough terrain. Remembering to keep your toes up will help every skier—experts included—to ensure that your ankles remain flexed at all times and in differing terrain. White says this is another fundamental drill, even for advanced skiers. One of the hallmarks of advanced skiing is carving. If you're an advanced skier seeking to improve your turns, exaggeration drills can help. In these tips, you can learn how to position yourself and initiate the proper movements when carving. If you've skied in powder, you know how difficult it is to find a lost ski in the snowy depths. However, if you're going to take on the powder—as many advanced skiers love to do—you need to be prepared. Learning to get up after a spill without taking off your skis is probably the best way to avoid losing a pole, as you'll see from these tips. Sit sideways across the hill with your skis together. Place your pole tips in the snow above your uphill knee. Use one hand to grip the other just above the snow. Now, in one fluid movement push yourself upward with the bottom hand while pressing down on the pole grips. Most glades—or tree-lined and forested areas on ski slopes—are black diamond runs, and rightfully so, because it takes agile turning and utter confidence in steering to make it down safely. Whether you're a first-time glade skier or you made your tree-skiing debut many years ago, check out these tips and review glade skiing safety by clicking the link on this slide. The backcountry, or "off-piste" as it is called in Europe, is the favorite place of some of the most advanced skiers. However, if you want to ski off-piste, it requires more than solid skiing technique. You also have to be aware of many other factors, such as avalanche risk. These tips will help you navigate the countryside safely as you do some off-piste skiing.